Hurricane Michael is expected to make landfall as a Category 3 storm and bring damaging tropical storm force winds through much of Georgia. 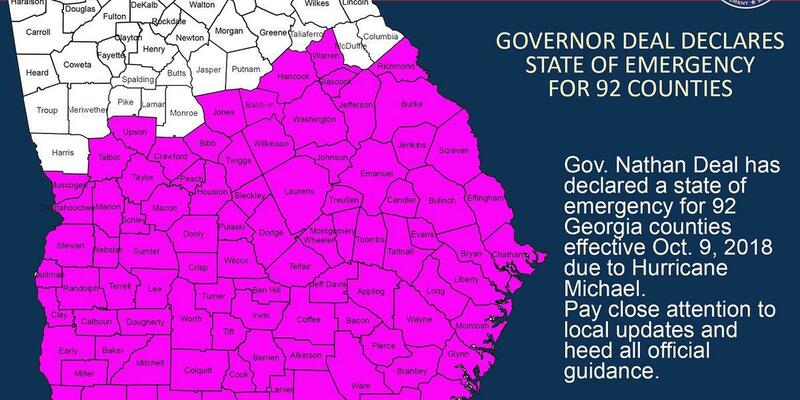 National Weather Service meteorologist Kyle Thiem said Michael will weaken some before reaching South Georgia, bringing 60 to 70 mile per hour winds. Hurricane Michael is also expected to bring 2 to 10 inches of rain to much of the state and an increased chance of tornadoes Wednesday and Thursday. Tropical storm force winds between 39 and 73 mph are expected in Georgia Tuesday night throughout the day Wednesday. A moderate risk of flash flooding exists in much of the southwestern part of the state. Only the northern portion of Georgia ia free from any flood warnings, the NHC said. Now is the time to prepare for the effects of Michael, Ashley Henyan with the Red Cross said. "Make sure you get an emergency preparedness kit put together. Do that now," Henyan said. "Make sure you have extra batteries, flashlights, first aid kit, crank radio, medications, at least three days worth of food and water for every member of your family and pets." Henyan also suggested making a plan now to evacuate your family members and pets if necessary. "Talk with your family about what you would do if you had to evacuate where you would go," Henyan said. "Make a plan for your pets know where you can locate a pet family shelter or a shelter that takes pets." Hurricane Michael was 390 miles south of Panama City, Fl., at 5 a.m., moving north-northwest at 12 mph with sustained winds of 90 mph. The National Hurricane Center has enacted hurricane, tropical storm and storm surge warnings for more than 300 miles of the Florida coast. Florida Gov. Rick Scott has declared a state of emergency in 35 counties. Residents in counties along Florida's Gulf Coast have been ordered to evacuate.